Over the past few years, mold has become more of an issue. This is due to improvements in home construction, as weird as that may seem. Because newer homes are constructed to be so tightly sealed, water and moisture get trapped inside. This creates the perfect climate for mold to form and multiply. This could result in a family moving into a home that already has a serious mold problem! Those with a healthy immune system can withstand the effects of mold fairly easily if there isn’t repeated exposure. If they are exposed to mold for an extended period of time, they will eventually feel the side effects of being around it. It could appear as a small allergic reaction or a big respiratory issue. Determining if you have mold is much less difficult than you may think. Look around your home in areas that collect moisture, like the attic, bathrooms, kitchen area, and the basement. Check the visible pipes, flooring, walls, and other surfaces to make sure that there aren’t any signs of water damage or mold particles. Common household molds can be taken care of with an over the counter cleaner, but if you are questioning a bigger issue, it is best to get a professional involved. 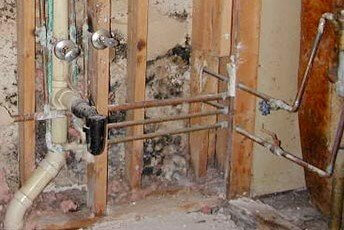 A mold professional will come to your location and assess the situation. They will determine what type of mold is present and if it is a health concern. They will then come up with a plan to contain and get rid of it, so the home becomes safe again. In addition to taking care of the visible mold, they will be able to track down the hidden culprits as well, With their experience and training, they know exactly where to look and what methods will work best to take care of the issue. Of course, some damage caused by mold is not repairable. Some drywall, flooring, or other porous surfaces may need to be replaced along with the mold removal. Getting rid of mold is not an easy task. Some homeowners try to take it upon themselves and find themselves in a bigger conundrum than originally anticipated. Because some molds cause more health issues than others, the homeowner my wind up sick and unable to continue the process. Even worse, they may not get it all and it may continue to spread throughout the home. It isn’t worth the risks to take care of it yourself. It is better to contact a mold removal specialist to make sure your home is safe for yourself and your family.